We appreciate your considering Yuquiyú — a glamorous camping, or “glamping,” destination. We provide shelter from the sun, rain and wind in artisan-crafted treehouses with hot and cold running water, electricity, a comfortable bed, a well-equipped kitchenette and a luxurious bath. 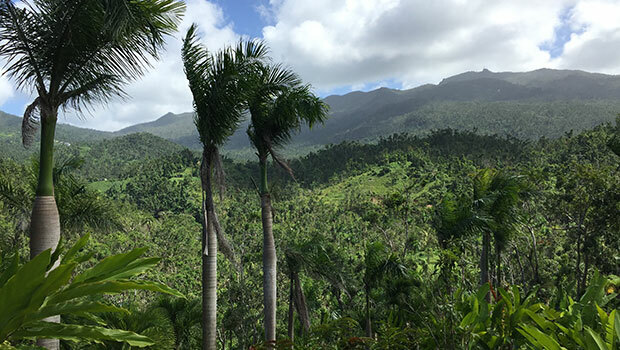 Surrounded by a tropical garden with a cascading river, each treehouse has an iconic view of El Yunque Peak. 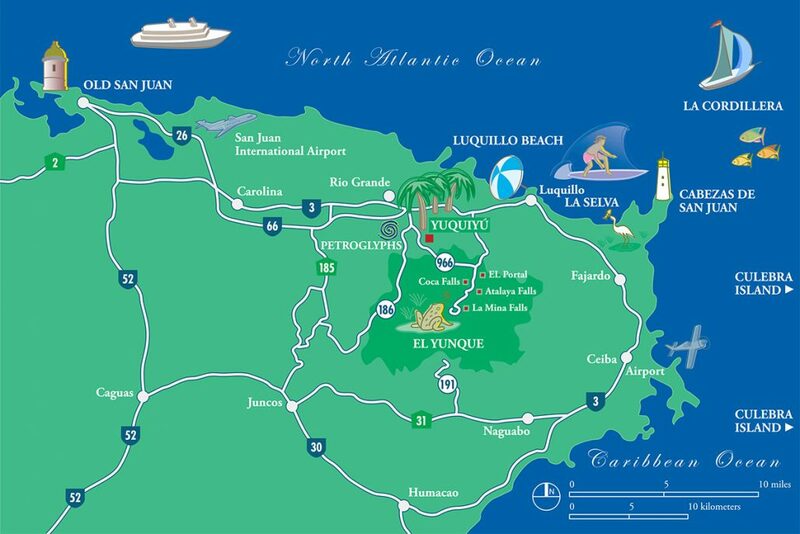 Nearby, you can discover the rainforest, multi-hued beaches, sea turtle nesting sites, coral reefs, a bioluminescent lagoon, ancient petroglyphs, a Spanish colonial city and Culebra Island. We offer a unique experience — one unlike a hotel, resort, inn or bed and breakfast. 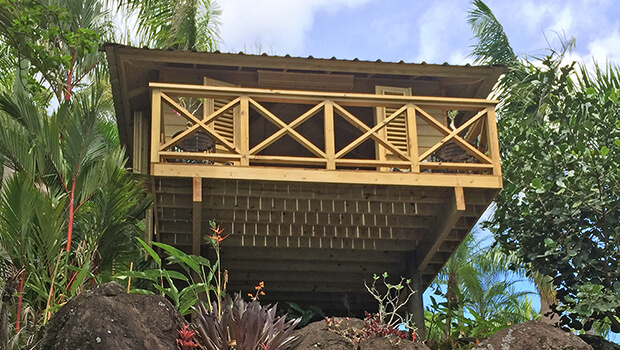 Our rustic retreat is perfect for a couple seeking a romantic escape, newlyweds seeking a honeymoon destination or an artist seeking tranquility and inspiration. We are not for everyone, but if you have a sense of adventure, love being close to nature and want to experience Caribbean living the way it ought to be, Yuquiyú may be for you. Our rate for La Cara de Indio, La Cascada or El Mirador starts at $200 per night. Tax adds 7%. Each treehouse has one queen-size bed and can accommodate a maximum of two people. The minimum age is 18 years. The minimum stay is two consecutive nights. No pets are allowed. Check-in begins at 3 pm and check-out is at 12 pm. To take advantage of any time you have before checking in, you may wish to consider our recommended restaurants and explorations. After checking out, you are welcome to store your baggage in our office, and continue to enjoy the property until it’s time to depart for your next destination. We only book directly in order to provide the highest level of personal attention and quality of service to our guests. Full payment by credit card is required to guarantee your reservation. There are no refunds, but you may reschedule, subject to availability, if you cancel your reservation in writing at least two weeks in advance. Each treehouse has hot and cold running water as well as electricity. The fully-screened interior contains a queen-size bed with a 10″ pocket spring mattress by Danish designer Per Weiss, memory foam contour pillows, bedding and handmade cabinetry. The kitchenette features a granite countertop, stainless steel sink and faucet, two-burner gas stove, convection oven, refrigerator, blender, French press, kitchenware, electric fan and other amenities to make your stay more comfortable. The bath has soap, shampoo, conditioner and cotton towels. The balcony has arm chairs and a bistro table. Citronella candles provide romantic lighting. Additional housekeeping services are provided on stays of over three nights. Major cell phone carriers have coverage in our area. We do not have WiFi Internet. 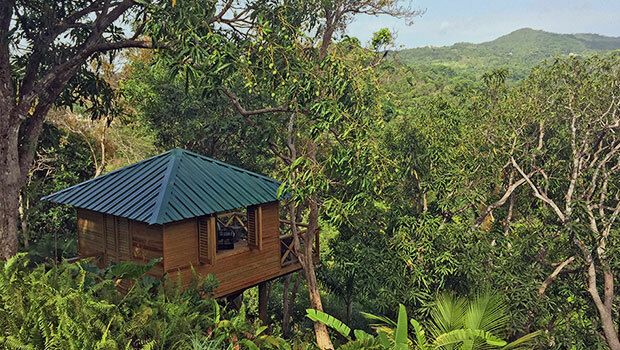 In each treehouse, we provide everything our guests need to French press coffee from a Puerto Rican hacienda, brew an herbal tea from our farm and make a vegan breakfast of granola, coconut milk, cashews, dried figs, dairy-free yogurt, freshly-picked fruit and lemonade. Honey, non-dairy creamer, olive oil, Himalayan pink salt and black pepper are included. Kindly let us know if you would like more of any item. Guests can use the well-equipped kitchenette in their treehouse to prepare their own food, including eggs and dairy. Please note that Yuquiyú is meat free (from any kind of animal, including mammals, fish, fowl and others). We ask guests to respect that principle by not bringing any meat onto the property. Restaurants offering a variety of cuisines are close by. Most of all, Yuquiyú is about tranquility — you can watch clouds swirl around the rainforest peaks, take a walk in the woods, meditate by the river, rejuvenate in a natural pool, be enchanted by the moonlight and contemplate the starry night. 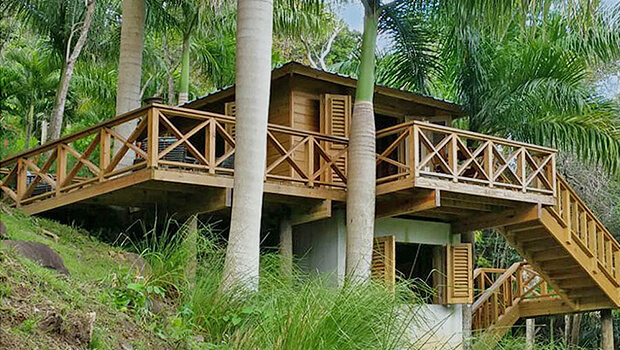 With one of our treehouses as your base, you can discover the rainforest, multi-hued beaches, sea turtle nesting sites, coral reefs, a bioluminescent lagoon, ancient petroglyphs, a Spanish colonial city and Culebra Island. For an introduction, see our Explorations page. For details, see What Can I Do? 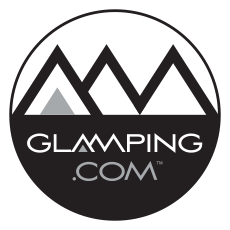 We have been selected to appear on the most prestigious glamping website, Glamping.com. As well, our guests overwhelmingly rate us at 5 stars. After your visit, we hope that you, too, will post photos and write a review on TripAdvisor, Google or Instagram. Thank you for supporting Puerto Rico through tourism. Guests should be aware that a rental car is essential due to a lack of public transportation, taxis and car service outside of San Juan. After arrival at the San Juan International Airport and exiting Baggage Claim, take your car-rental agency’s shuttle to their office. From there, proceed east on Highway 26 and continue east on Highway 66 until it ends. Exit right, take the first right up Road 186, left at Km 25.3 onto Road 966, left at Km 1.2 onto La Pirámide, right and right again to the top of the hill, where you will see the Yuquiyú sign. Park on the flat, grassy area on top of the hill and walk down the gravel driveway next to our sign. If you use Google Maps, be sure to select “Yuquiyú Treehouses” or use the following link: Yuquiyú Treehouses. If you prefer, navigate the old-fashioned way by using the maps on How Do I Get There?. Travel time is 30 minutes. If you prefer the Scenic Route Along the Ocean, travel time is 55 minutes. 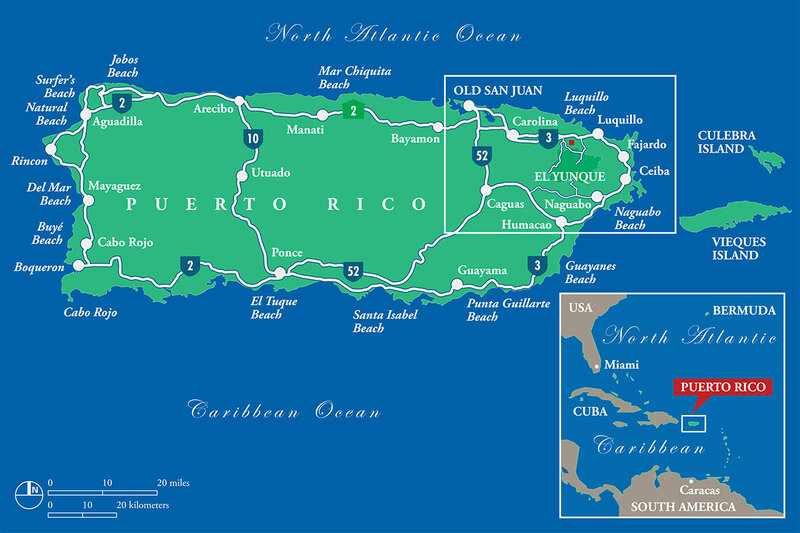 Upscale transportation services are available from Puerto Rico Green Transportation.